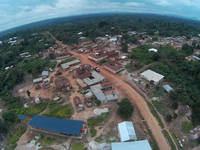 Thus, from February 2017 to July 2019, we are collaborating with some of the design teams in the competition to organize construction workshops to build the design entries based on site at Abetenim in central Ghana. To do this, we have begun to compile strategies and gather a community of supporters around the rural school project. We approach the school design and construction project as a development-aid with a direct impact on the rural community of Abetenim. It is community architecture. By this, the design proposals will be built with and for the community, with the community supplying the land for the building. Through an open call for participation, each workshop will bring together participants from different countries to come together to collaborate on the building project for cross fertilization of skills and knowledge. To ensure success, we have a Community Coordinator at the site to help coordinate your workshop by helping in souring materials, language translation, coordinating the various activities, and other local administrative help you would need to ensure workshop completion. 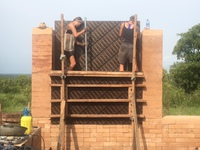 And don’t worry, at Abetenim the local masons have experience in building with earth in such methods as rammed earth, poured earth, mud brick and cob construction. 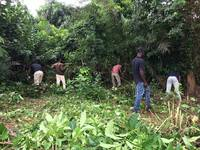 WORKSHOP LOCATION: Abetenim in Ejisu-Juaben District near Kumasi in the rural territories of the ancient Ashanti region of Ghana. 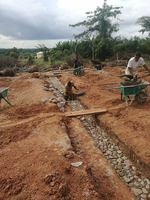 COSTS: Food and accommodation €100/$120 per week and project contribution is €400/$450. Airfare, visa and vaccination are on your behalf. Accommodation is by guesthouse at the Abetenim Arts Village. We have 9 guesthouses, the houses have running water and electricity. 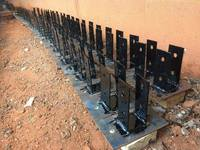 At the site, you can access the Internet with pendrive wireless connection. We have a kitchen for the workshop group to cook their food. And there is a cook at the site if your prefer a local cook preparing the meals for your workshop team. FREE TIME ACTIVITIES: It's not all works! Immerse in the local culture and lifestyle. Live and work among the local people. Take part in some of the social events in the everyday life of the community, such as weddings, naming ceremonies, community labor, and meetings to gain new skills. There will be short breaks from the construction project to participate in field trips to experience any of the regional historic attractions, lush forest hikes or guided tours to explore the nearby villages and townships. And you can spend the rest of your stay collaborating with the Abetenim Women Sewing Cooperative, a local church group, storytellers or getting involved with the computer skills training of the youths at the Kukor Community Library. And the building workshops to realize design entries are listed below. Be a part of this collaboration. Let’s create change for people in need. 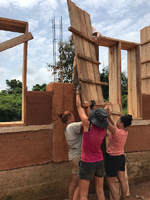 Join our team to help us create a classroom with community labor using both traditional and contemporary building techniques and local methods of construction. 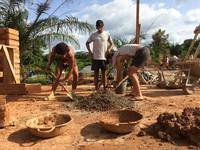 You’ll gain hands-on experience in earth-hand-made-construction by using local and recycled materials and an in-depth understanding of the local culture. WHO: Graduates and students of architecture, engineering, interior design, landscape architecture and sustainable practitioners from around the world. Students can use the opportunity for internship, personal research or thesis. 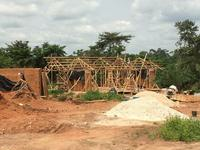 COST: €200 - €400 project construction (depending on donations) I 80€/week for accommodation and food. Time period of participation: two weeks to three months. WORKSHOP LEADERS: Penny Stergiopoulou and Lida Lioupi, Thessaloniki, Greece. 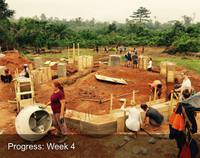 PARTICIPATE IN A PRACTICAL ARCHITECTURE WORKSHOP TO CONSTRUCT THE CAFETERIA FOR A SCHOOL IN ABETENIM, GHANA. 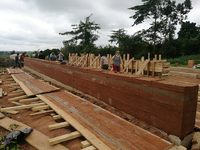 LEARN THE LOCAL CONSTRUCTION METHODS OF RAMMED EARTH AND LIGHTWEIGHT FRAMING WHILE PARTICIPATING IN A HUMANITARIAN ARCHITECTURE PROJECT. WE ARE LOOKING FOR PARTICIPANTS FROM ALL SKILL LEVELS AND ANY FIELD OR PROFESSION. COST: FOOD AND ACCOMMODATION 80€/WEEK PROJECT CONTRIBUTION 400€. AIRFARE, VISA AND VACCINATION ARE ON YOUR BEHALF. 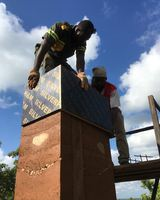 The school library will be built using local construction methods and traditional techniques such as rammed earth. We will immerse in the Ashanti culture and lifestyle to explore and learn earth construction. Everyone is welcome! 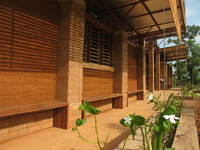 Architects, students, volunteers from all around the world, and anyone interested in sustainable design & construction. Students can use the opportunity for internship, thesis or personal research. Be part of this incredible experience to help build my design entry in the 4th Earth Architecture Competition: Designing a School for Rural Ghana. 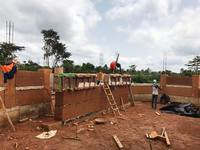 We require between 30 and 40 international volunteers to fund and help construct the school classroom in Abetenim, Ghana. 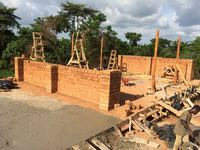 If you cannot come to Ghana with us, consider making a small donate to make the project happen. 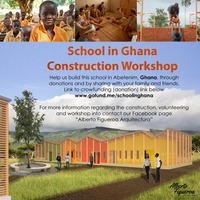 To make a donation, go to www.gofundme.com/schoolinGhana And help spread the word! Hi! We, Anna & Jaap, are two architects from Vienna who want to use our professional skills to build a brighter future for rural youths in Abetenim in Ghana. In 2016, we participated in the 4th Earth Architecture Competition: Designing a School for Rural Ghana, organised by the Nka Foundation. Our design was shortlisted by the international jury and now we have been invited to build our design for the school cafeteria in Abetenim. In Abetenim village, the children do not have local access to secondary school education and must walk prohibitive distances to access the few schools that do exist. By building a local secondary school, the children can continue their education in their hometown. Everybody is welcome: Graduates and students of architecture, engineering, design, landscape architecture, digital arts and volunteers from around the world. A student can use the opportunity for an internship, thesis or personal research. 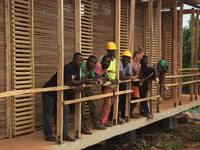 Join the workshop to build INSIDE OUT, a prototype of a sustainable school in Ghana that won the 2nd prize in Nka Foundation's 4th Earth Architecture Competition. You will be a part of an international team to participate in every phase of our humanitarian architecture project. You will learn new skills as we immerse in the local Ashanti culture through site analysis, field trips and the construction of the project with the local community. 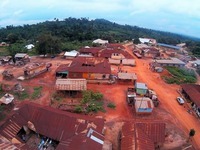 Abetenim village, Ashanti Region, Ghana. Everybody is welcome: graduates and students of architecture, engineering, design, landscape architecture, digital arts and volunteers from around the world. Students can use the opportunity for an internship, personal research or final thesis. To receive more information and to apply for the workshop, contact us at insideout.ghana2017@gmail.com. Applications will be reviewed until spots are filled. Project Contribution: 400€ (to cover the cost of the construction). Personal expenses such as airfare, visa, insurance and vaccination are on the behalf of each participant. Andrea Tabocchini and Francesca Vittorini, architects in Italy. Join us as a workshop participant to realize a sustainable classroom typology for a school through use of traditional African technique and local methods of construction. You will immerse in the Ashanti culture and lifestyle to explore, learn and be a part of this unique experience. Accommodation will be at a guest house at the Abetenim Arts Village. Everybody is Welcome: graduates and students of architecture, engineering, interior design, landscape architecture and sustainable practitioners from all around the world. Join us! College credits are available. 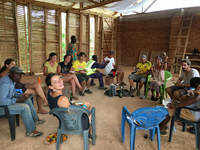 WHO: Volunteers interested in hands-on construction, helping others, and immersing themselves in the Ashanti culture. ARCHI+EACH aims to provide interactive learning opportunities based on inclusive community involvement, focused on bridging the gap between responsive design and local building methods. In collaboration with the Nka Foundation, we will host a workshop to build a prototype classroom within a larger scale masterplan, using traditional and local construction methods. Join social architecture and experience unforgettable impressions on site with an international team! 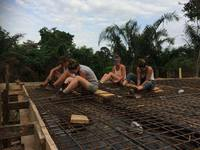 Implement your knowledge and gain new expertise in working with natural materials creating an environmentally friendly building in the beautiful country Ghana. We are looking forward to your application! COSTS: Project contribution: 400€. EARLY BIRD: 350€ (apply in February). Food/accommodation: 120€/week (airfare, visa, vaccination on your behalf DAAD scholarship possible. QUESTION: Eu sou estudante universitaria e gostaria de ganhar experiencia com vosso grupo,sou agil,e tenho facilidade em aprendizagem. I am a university student and would like to gain experience with your group, I am agile, and I have facility in learning. ANSWER: To participate in any of the workshops listed above, consider one of the following options: (1) Fill out the application form: Ghana School Building Workshop.ApplicationForm.doc (78 KB) and email it to us via info@nkafoundation.org . And we will forward it to the right workshop; or (2) contact the leader of the workshop you are interested in. The contact email for each workshop is listed above. WHO CAN PARTICIPATE: Architecture students, architects, sustainable practitioners and volunteers from around the world. A student can use the opportunity for internship, thesis or personal research ! COSTS: Participation fee until 30th 05.2018: 400€ (350€ depending on donations) food and accommodation: 100 € / week (fights cost, are not included). WORKSHOP LEADERS: Diego Peña Jurado, architect in Germany and Francisco Rodríguez Zafra, architect in Spain. Join us as a workshop participant to build a unit of a vocational skills center for youths of Sang township. Join us as a workshop participant in a case study house about rammed earth construction and communal dwelling typologies. Together, we will be temporarily Ghanaians by immersing in local culture and lifestyle to gain an in-depth understanding of the local issues and practical experience. You’ll have the opportunity to explore local earth architecture traditions through site analysis, field trips and the construction process. Volunteers can join at any time and participate for a minimum of one week. A student can use the opportunity for an internship, thesis or personal research to rediscover the rudiments of architecture and nuances to enrich your design thinking. WHO: Graduates and students of architecture, design, engineering, urban plan, arts and others from around the world. Students can use the opportunity for internship, personal research or thesis. TO APPLY/INFO: sangmetandi@gmail.com / info@nkafoundation.org. Applications will be reviewed until spots are filled.